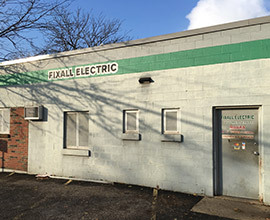 As a proud third-generation family-owned and operated business serving Grand Rapids and West Michigan for over 67 years, Fixall Electric Motor Service continues to provide high-quality electric motor repair, sales and service at affordable prices. Supported by exceptional customer service and a dedication to offering value with every electric motor repair or sale — from the smallest residential pool pump to the largest industrial hoist — Fixall gets your motor running! Ray Baar, Art Towner, Dan DeLeeuw and Jerry Weatherbee started Fixall Electric Motor Service in 1950 in Grand Rapids, Michigan. All have since passed on to the big shop in the sky, where they maintain the lightning generator and wind-blower motors. Ray’s son Chuck then purchased the business and continues to work at the shop alongside his brother Dave and sister Amy. Fixall proudly remains a third-generation family business as Chuck’s son Adam, Dave’s son Jon and Amy’s daughter Carrie have all become integral members of the team. This close-knit staff works hard but also enjoys a good joke over donuts and coffee — while taking great pride in overcoming the challenges of motor repair and maintenance. With over 100 years of combined experience, the electric motor repair specialists at Fixall most likely have worked on your style of motor many times. Our technicians can help you determine whether a repair or replacement will be the most cost effective option. Our sales staff only works with the top quality brands and advise you on finding the best electric motor based on your needs and budget. Fixall Electric Motor Service is a member of the Electrical Apparatus Service Association (EASA), the Grand Rapids Area Chamber of Commerce, the West Fulton Business Association and the Better Business Bureau of West Michigan. For more information about the electric motor repair experts at Fixall Electric Motor Service, please call the shop directly at 616.454.6863.